Does Honey Lose Nutrients When Added to Tea & Coffee? Tea with honey conjures up images of home and hearth, and rightly so. Honey-sweetened coffee is less common, though the smooth sweetness nicely counteracts coffee's slight bitterness. Using raw honey to sweeten beverages is a healthy choice for many reasons, though adding honey to hot tea and coffee does destroy some of its nutrients. Fresh, raw honey is loaded with antioxidants, though it contains only trace elements of other nutrients. The main advantage to using honey instead of refined sugar is that the natural sugars in honey take longer to digest than refined sugar. That means that your pancreas does not have to secrete as much insulin to capture and store the extra sugar. When the insulin scours the sugar out of your blood, your brain signals that it will need more sugar and you feel hungry. Honey can help you avoid that spike and drop, whether taken alone or added to tea or coffee. Raw honey is not subjected to any sort of heat processing, though it is sometimes strained for a more pleasing presentation. This means that it still contains all of its natural nutrients. The best temperature for pasteurization of honey is 145 degrees Fahrenheit, according to "The Beekeeper's Association Newsletter" at Mississippi State University. This destroys many of the nutrients in the honey the same way that cooking vegetables at high temperatures breaks down their vitamins and minerals. Adding pasteurized honey to tea or coffee will have no effect on its nutrients, because they are already destroyed. For raw honey, it depends on the temperature of the beverage. Tea and coffee are generally made with water that is either boiling or close to it, which is around 212 F, though that temperature is lower at high altitudes such as Denver, Colorado. That temperature is high enough to burn your mouth, and it is also high enough to destroy the nutrients in raw honey. 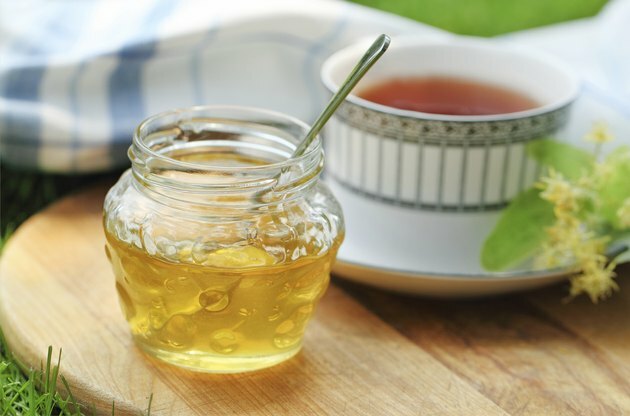 Letting your tea or coffee cool to a drinkable temperature may help raw honey keep its nutritional value. Adding either raw or pasteurized honey to iced tea or coffee should have no effect on its nutrients. The cold may make the honey harder to dissolve, so using a small whisk is helpful.